It is raining in Seattle today - a slow, soaking rain. After this kind of rain, the weeds are easier to pull and the wet leaves rake nicely into a pile that stays put until you get them into the compost or yard waste bin. I love gardening in the fall. The temperatures are cool so I don't get overheated when I work. Fall is a long season in Seattle with three full months of color, and being outside, watching the landscape change is good for the soul. 1 - Tidy up. Start by clearing away dead foliage on perennials. Rake leaves. You may have to do this a couple of times before fall is over because don't plants go dormant here all at once. 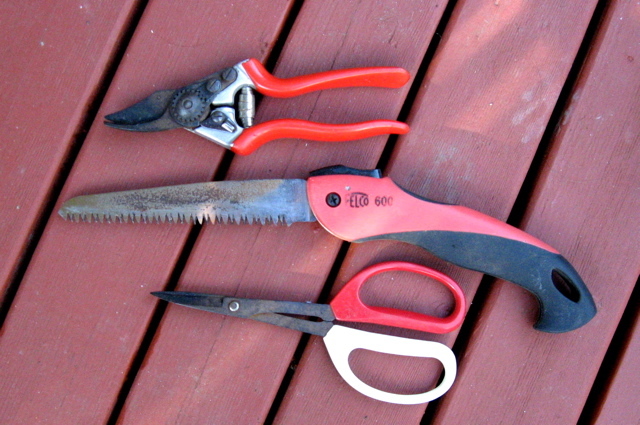 Do a thorough weeding job - you will thank yourself next spring. 2 - Mulch beds. Most horticulturalists will agree that mulching in fall is a good idea. But we don't all agree on the best way to do it. Some people rake piles of leaves into their planting borders and call it good. I prefer to use a composted product like Steerco (available from Sawdust Supply in Georgetown). I've tried the leaf method and found that after a lot of rain, the leaves stick together, forming a solid mat that smothers ground covers. If the leaves aren't raked off of the crowns of perennials early enough in spring, the new shoots go off in strange directions and the plants fail to do well. Steerco, on the other hand, provides a blanket that protects plant roots from the cold while allowing air circulation. It also looks a lot better. 3 - Winterize sprinkler systems. It seems obvious that sprinklers should be shut off in the fall, so I am surprised by how many people overlook this necessary chore. Sprinkler lines are shallow and often burst in cold weather. This creates a big problem, and not just for the homeowner, as this mudslide story on the West Seattle Blog from last December shows. 4 - Plant trees and shrubs. This gives plants a head start on next year. Root systems will start getting established well before the busy growth season in spring. As an added plus, local nurseries have terrific plant sales going on right now. 5 - Plant spring blooming bulbs. If you want daffodils, crocus, tulips and hyacinths next year, you have to plant them now. When you visit your local hardware or garden supply store, you will find lots of fertilizer products. How do you choose the one(s) that are right for you? Here's some basic information to help you decide. The main nutrients contained in most fertilizers are Nitrogen, Phosphorous and Potassium (chemically speaking: N, P and K). On the front of the package, you will see three numbers, usually in large print, that tell you the percentage of each nutrient contained in that product. A 20-20-20 fertilizer, for example, is one that contains 20% of each major nutrient; a 30-10-10 contains 30% nitrogen, 10% phosphorous and 10% potassium. To decide which fertilizer you need, you first need to know what each of these nutrients do for a plant. Potassium promotes root growth and benefits the general health of the plant, making it more resistant to disease. 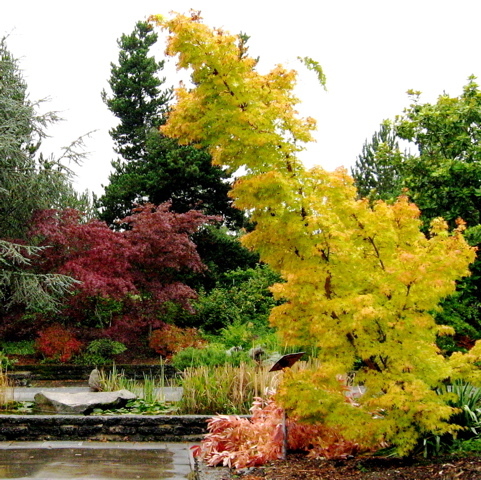 In general, evergreens and lawns need fertilizers with a higher percentage of nitrogen. Blooming plants need more phosphorus and potassium. Good nutrient ratios to look for are: 3-1-2 for lawns and 1-2-2 for flowering plants. NOTE: Fertilizers with a high percentage of nitrogen will suppress blooming, so don't use lawn fertilizer in your perennial beds! There are a few specialty nutrients you should know about. Some evergreens, most notably rhododendrons, suffer from an iron deficiency that causes their leaves to turn yellow. This is quite common and can be corrected by using a chelated (pronounced KEY-lated) iron product or a fertilizer formulated for acid loving evergreens. 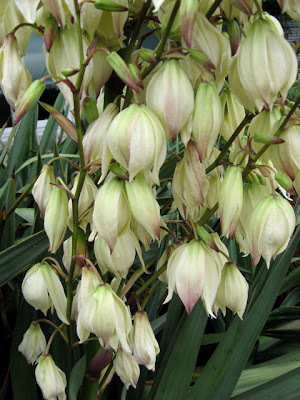 Bulbs are heavy users of calcium (bone meal) and like a top-dressing of it after blooming and a bit of it worked into the soil when they are planted. Roses and tomatoes need extra magnesium -- check the package when you buy all purpose fertilizer to be sure magnesium is included as a trace element. There are several forms a fertilizer can take: granular, liquid, spikes. Which form is best? The granular types that you mix with water and pour around the base of the plant are quickly and easily taken up by the roots. (They are a good choice for treating those yellow rhododendrons.) The disadvantage is that the nutrients can leach through the soil quickly in a rainy spell, moving them deeper into the soil profile and out of the reach of your plant's root system. Dry, granular products that you sprinkle on the soil do a good job of slowly releasing nutrients. They are especially useful in wet weather. If you apply them in dry weather, water them in or they can burn your plants. Time-release fertilizers, such as Osmocote, come in round pellets (they look like white or green caviar). These fertilizers are expensive, but do a good job of slowly releasing nutrients over several months. 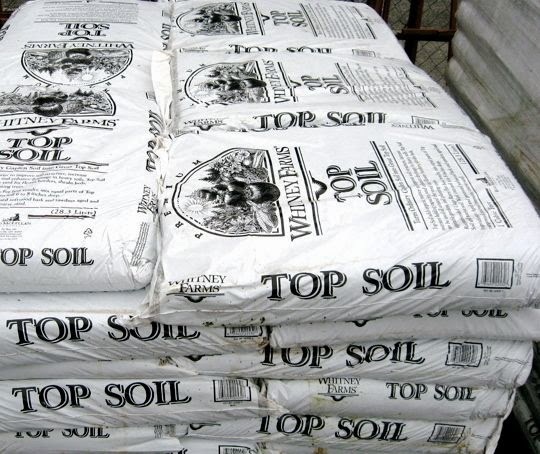 This type of fertilizer is often used in the nursery trade for their container stock. Avoid using fertilizer spikes. As water dissolves them, they create a concentrated pool of fertilizer which will burn the roots adjacent to the spikes while providing little or no benefit to other areas of the root system. Stick with the dry fertilizers and liquid mixes that you can spread evenly over the surface of the soil. Think you have over-fertilized? Water, water, water. This will dilute the fertilizer and wash it down below the root zone. Ever wonder how many bags of mulch, soil, compost or gravel to buy? Would it make more sense to have a yard of material delivered? Or will you need that much? End the guesswork. Measure your space and use this table to calculate how much to buy. When I was studying landscape design, most of my fellow students regarded Yucca plants (Yucca filamentosa) with contempt. YUCK-a, they would say. And with good reason. The foliage can look pretty ratty and grooming is difficult because the leaves are sharp and tough. If you decide that you want to remove the plant altogether, you have your work cut out for you. If you don't get all of the fibrous root out of the ground, it will sprout "babies," and you'll have to go at it again. I suspect that one reason we see so many unkempt clumps of Yucca plants is that people get tired of trying to dig them out, so they give up and let them continue to multiply. Thus adding to the YUCK factor. But on the plus side, just look at these flowers! Borne on stalks that can reach 10 feet high, they are a striking addition to the landscape. 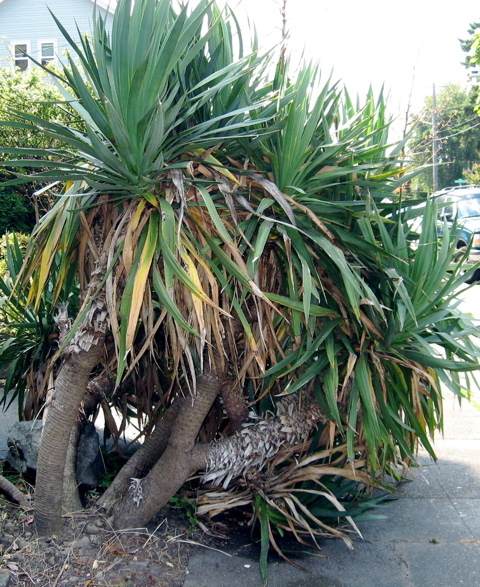 In addition, yuccas are tough plants that can handle drought and salt spray. Y. filamentosa, or Adam's Needle, is the cultivar seen in Seattle gardens. There are many other varieties, including Y. brevifolia or Joshua Tree, all of which require warmer climates than we have here.